Ever since 1967, writers have been debating the conflict. A historian is never alone when he writes. Even as he pounds away on the keyboard in the solitude of his room, he is conversing with other historians who have written about his topic. Past historians have covered just about everything. Almost every story has been debated and re-debated, argued and counter-argued. The historian must find his own voice and, most importantly, something new to add to the conversation. Such was my situation in the summer of 2014, when I decided to write a new history of the Six-Day War. It is no wonder that the first image that came to my mind as I embarked upon this new project was of entering a minefield. Fifty years after it took place, the war of June 1967 is still in the news. Israel’s settlements in the West Bank, its antagonistic relations with the Hamas government in Gaza, and its hold over the Golan Heights are all legacies of the Six-Day War. If Israel’s pre-emptive strike on Arab countries on June 5 was justified—if Israel had good reason to fear imminent annihilation by the threatening Arab armies on its borders—then it would at least be easier to argue that Israel had a right to hold on to what it took by force in the war. However, if this was a war of choice, planned and fought to enlarge the Jewish state’s territory, then Israel’s case to maintain its presence in formerly Arab lands loses its potency. Rivers of ink have been spilled to argue the matter, and I had to swim them. One thing that struck me immediately was how the landscape had changed over time. As writers have sought to capture the war in words, they have also described the hopes and fears of their era. The first wave of books, published shortly after the war ended, is a case in point. Written by Israeli and Western journalists, most of them reported breathlessly on Israel’s decisive victory over the Arab military coalition that had amassed on Israel’s borders. For Israelis, their triumph was a moment of redemption from the deep fear that had enveloped the country in the weeks preceding the war. For other denizens of the West, the war was a rare example of a positive story at a time when the war in Vietnam was developing into a quagmire. What happened in the Middle East seemed to be a simple tale about the miraculous victory of peace-loving Jews, ominously threatened by hostile Arabs backed by Moscow. Like many of the early histories of the war, Randolph S. and Winston S. Churchill produced a rather pro-Israel book. Take, for example, Randolph S. Churchill, the wayward son of the great Winston Churchill, and Winston S. Churchill, the grandson of the famous statesman. The two wrote a quick book about the war, which is still in print. They divided the labor: Randolph remained in London, kept his ear to the ground, and contacted friends in high places to reconstruct the diplomatic side of the story. Winston Junior, 27 at the time, a war correspondent like his famous grandpa, was in Israel during the war. They produced a rather pro-Israel book, despite the fact that Winston the Younger had good reason to be angry at Moshe Dayan, Israel’s defense minister. On June 2, 1967, 24 hours after the one-eyed general had been appointed to his new post, Winston paid a visit to Dayan’s villa in a leafy Tel Aviv suburb and asked Dayan whether he thought a war would break out soon. Apparently, after spending two weeks in the Holy Land, the young Churchill was getting impatient. Dayan later wrote in his memoirs that he liked Churchill but was somewhat surprised by his temerity. Did this British journalist really expect him to disclose the exact date on which Israel would pounce? Despite Israel’s historic debt to Churchill, Dayan made some misleading remarks that convinced Winston the Younger to board a plane back to London a day before the outbreak of the war. Did he begrudge Dayan’s subterfuge? Not at all. Winston ended this anecdote by writing: “Israel, like a cowboy of the old Wild West, did not wait for her enemy to draw—she had seen the glint in Nasser’s eye.” The book maintains the same tone throughout, barely disguising its admiration for the Jewish armed forces, describing them as “one of Israel’s greatest achievements.” It accepted unquestioningly Israeli claims that the country had been under mortal threat, and therefore within its rights to attack Arab countries. Neff, in fact, was witnessing the effects of Israel’s long rule over the West Bank and Gaza, a legacy of the Six-Day War. One of Neff’s stories for Time was an investigative report on a systematic campaign of beatings against Palestinian youths in the West Bank. To ascertain the rumors that had reached him, Neff visited a hospital in Bethlehem to see with his own eyes Palestinian teenagers with broken arms and legs. Neff was astounded that the United States could not halt the transgressions of its Jewish ally. How could it be, Neff wondered, “that a country completely beholden to the United States could thumb its nose at Washington”? Unlike the Churchills, Donald Neff was not swept away by postwar enthusiasm; he told a very different story. Removed 20 years from the event, Neff was aware of all the complications that had emerged from Israel’s stunning victory. Unlike Randolph and Winston Churchill, Neff was not swept away by postwar enthusiasm. And the book that he wrote, Warriors for Jerusalem: The Six Days That Changed the Middle East (1984), told a different story. Israel was no longer seen simply as an innocent victim of Arab aggression. Neff identified an emerging group of Israeli generals who had sought to involve their country in a war they were confident of winning. In his view, Washington allowed Israel to launch the Six-Day War only because Lyndon Johnson had been under enormous pressure from the Jewish lobby. Israel’s image was muddied by Neff’s book, and that trend would continue in the following years. In the late 1990s, the “30-year rule,” which generally allows publication of official archival records after that period, brought about the declassification of thousands of documents in Israel, Great Britain, and the United States. Historians could now get a far more granular picture of the war and its aftermath. This led to the publication of several major books about the war. One of them was written by Michael Oren, then a research fellow at the conservative Shalem Center in Jerusalem. Later, Oren would serve as Israel’s ambassador to the United States. In many ways, Oren’s book revisited the Churchill version of the Six-Day War and found it perfect. His bottom line was that Israel stumbled into a war it had not wanted to wage. But, faced with a threat to their existence, the Israelis proved far more resourceful than their Arab foes had anticipated. The book, which came out only one year after the massive terrorist attack of 9/11, seemed to strike a chord with the American public. The year it was published, Oren praised George W. Bush’s foreign policy, and in 2005 he wrote an article that explicated the parallels between 1967 and 2003. Like Saddam Hussein, Oren claimed, Gamal Abdel Nasser, the Egyptian president during the Six-Day War, had aspired to unite the Arab world. Just like Saddam, Oren argued, Nasser defied UN resolutions and had stockpiled weapons of mass destruction. Nasser wanted to wage a war of annihilation on Israel, but Israel “did not wait around” and launched a preemptive attack. Oren implicitly suggested that Israel’s war on Egypt in 1967 was as justified as the American war on Iraq in 2003. At the time, he probably thought this analogy bolstered his argument. With hindsight, this comparison only weakened it. Oren’s book, an overwhelmingly military history of the conflict, is mostly devoted to a meticulous reconstruction of the major battles. The pre- and postwar periods are skimmed lightly. For Oren, the six days of war seem to mirror the six days of creation. However, Arab writers have begged to differ. Mohamed Fawzi, who was the Egyptian chief of staff during the war, titled his memoir The Three-Years War, a reference to the War of Attrition, which began immediately after the Six-Day War and continued up to 1970. It consisted of a series of artillery exchanges and commando raids along Israel’s eastern and southern borders; 367 Israeli officers and soldiers were killed in action as a result. Mohamed Hassanein Heikal, the former editor of the influential Egyptian daily Al-Ahram, gave an interesting subtitle to his hefty tome about the war: Explosion in 1967: The Thirty-Year War. By doing so, Heikal was suggesting that it should be assessed within the broad context of the Israeli-Egyptian conflict, which had begun with the 1948 war for Palestine and ended not long after the 1973 Yom Kippur War. In the 1973 war, more than 2,000 Israeli soldiers died, and in the following years, Israel had to give back every inch of Egyptian land it had conquered in 1967. 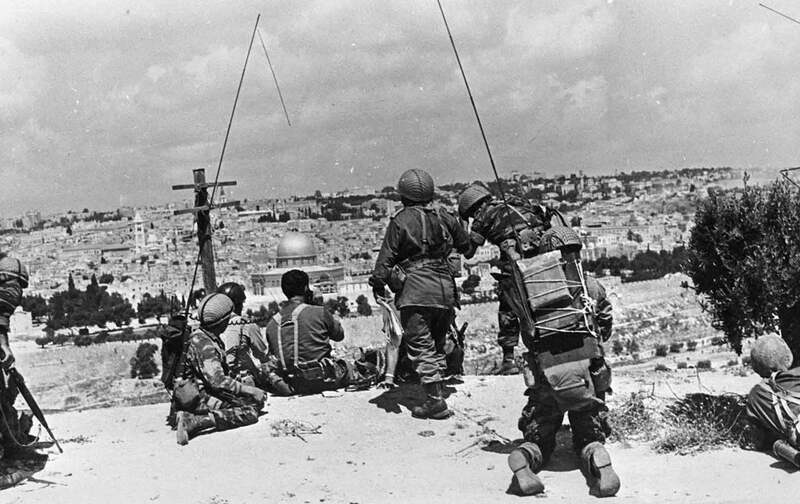 Israel’s military victory in the Six-Day War may have been impressive, but in retrospect, it was just one engagement in a long, drawn-out struggle. The brilliance of Israel’s victory dims when looked at from a long-term perspective. Tom Segev, a former columnist for the liberal daily Haaretz, took a more critical position in his book “1967” (2005). Like these Arab writers, Tom Segev, who for many years had been a columnist for the liberal daily Haaretz, took a more critical position in his book 1967 (2005). Building on the findings of another Israeli historian, Ami Gluska, Segev focused on the troublesome pattern of civil-military relations in Israel. In his view, the headstrong chief of staff, Yitzhak Rabin, drew a dovish cabinet into an unnecessary confrontation with the Arab world. Rabin, supported by his colleagues in the general staff, believed Israel could escalate its confrontation with Syria with impunity. Prime Minister Levi Eshkol wanted to avoid war and ordered the military to use defensive methods in dealing with the Syrian provocations. However, the generals ignored Eshkol’s instructions and went ahead with preparations for a major operation against Syria. When Egypt, Syria’s military ally, sent its forces into the Sinai in May of 1967 to deter Israel from attacking Syria, Israeli generals forced the prime minister to green light an all-out offensive in early June. In Segev’s story, Israel is no longer a victim of Arab hostility but rather an aggressive power that pushed Arab leaders into a corner. And so, ever since 1967, writers have been debating the Six-Day War. The sweet afterglow of military success inspired fawning chronicles of Israel’s victory. However, as the price of maintaining the post-1967 borders rose, more sober assessments came to the fore. New archival revelations helped historians realize just how fractured and antagonistic the Israeli decision-making process was in the years preceding the war. The focus of the story now turned from the external threat, which had largely been a myth, to the way in which Israel’s military establishment manipulated public opinion and strong-armed civilian leaders. As I have argued, each historian writing about the Six-Day War brings a certain Zeitgeist to his description. My book about the war is no different. As an Israeli, I grew up in the shadow of wars. People my age are known as the “winter-of-1973 generation.” Our fathers came back from the harrowing battlefields of the Yom Kippur War, eager to bring new life into the world. The 1991 Gulf War forced me to watch my Holocaust-survivor grandfather put on a gas mask. No wonder I devote so much time in my volume to figuring out why the war happened in the first place. As a scholar, I learned my trade in an era in which the Internet and cheap flight have enabled historians to access an ever-increasing selection of archives. For that reason, my research covers more archives, including several in the former Communist bloc, and in more languages, than any of the books mentioned above. Furthermore, the same process of globalization that allowed me to travel the world also exacerbated tensions between developed and developing countries. Indeed, most discussions of international politics today, from terrorism to the growing number of refugees, revolve around this theme. For that reason, I prefer to discuss the war in its global context. For instance, I argue that Third World countries were in bad shape during the 1960s, which explains why there were so many coups and regional wars, such as the Six-Day War, in that decade. You would think that, with all this self-confident sales talk, deep in my heart I believe that my book is the last word on the subject. It is not, and no book is the last word on anything. Historians are going to keep on arguing about how the 1967 war came about. American and Israeli writers who believe that the Arab-Israeli conflict is intractable and unsolvable are still searching for ways to portray Israel’s attack in 1967 as an act of self-defense. This is part of a larger narrative that depicts Israel as a Western citadel surrounded by a hostile Arab world. Historians who believe that Arab-Israeli coexistence and cooperation are possible seek to show that the war was avoidable and that a diplomatic solution to the crisis of May 1967 was within reach. In short, when we debate the Six-Day War, what we are actually arguing about are the chances for peace in the Middle East today. Guy LaronGuy Laron is the author of The Six Day War: The Breaking of the Middle East (2017).